“Hey, kids, we’re going to see the world’s second largest ball of twine!” Ray called out to the backseat, in his best Clark Griswold imitation. Ray loves the open spaces, loves the silence — spotting a lizard or hearing a coyote howl. Me, not so much. I’m a city girl, and throughout our 15-year relationship have often been known to hum the theme to Green Acres at opportune times. But we couldn’t afford a trip to the big city, and even the idea we’d had to drive to New Mexico seemed too ambitious when we realized we only had four days. So we headed north. 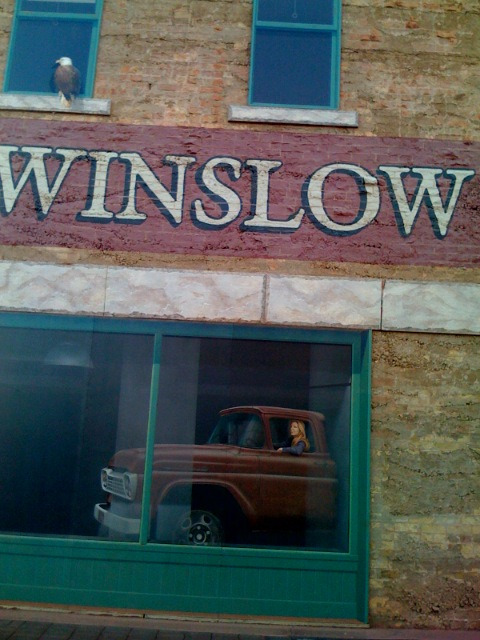 Ray’d barely been to Winslow, and not to any of the nearby attractions, if you can call them that, so it was new for all of us. 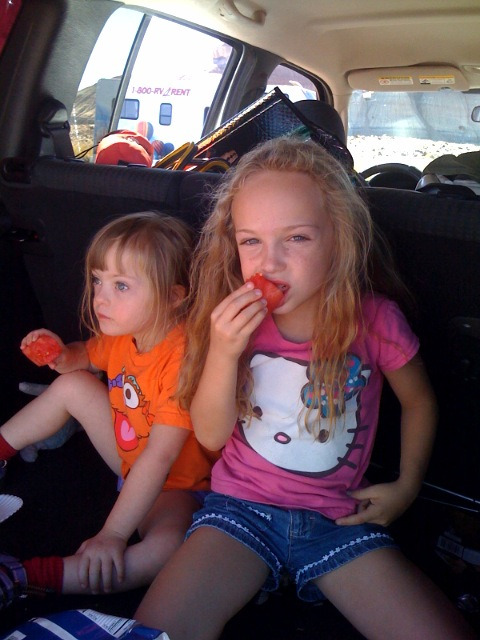 The girls were thrilled to be together, and on a road trip. We all were. It’s been a crazy busy fall, and I’m making up for the days away now (writing at 3:45 am, I’m tripping over my typos). But it’s good that we did it. No school, no work (except for email and a couple phone emergencies for Ray), no doctor appointments, no therapies. No IQ tests or meetings with the principal or worries over playground safety. No mention of Sophie’s “disability” at all — except for one time, during the trip. I promise I won’t share a painfully boring blow-by-blow of our vacay. Just some highlights. The idea was to spend one night in luxury (La Posada, an amazing little hotel so misplaced in Winslow I kept hitting myself on the head to be sure I wasn’t dreaming it up); one night in kitsch (the Wigwam, several cement tee pees in the center of the town of Holbrook); and two nights cheap — my parents’ summer house in Flagstaff, which they abandon as soon as a leaf turns. Ray was the one who chickened out on the tee pees when we got to Winslow; he dug for his credit card and bought a second night at La Posada as soon as we hit the lobby. And he’s not a hotel kinda guy. He would have been thrilled to camp the whole four nights. But this place is special — built to accomodate the influx from the railroad boom, it’s a Harvey House designed by a woman named Mary Colter (great for the girls to hear about a woman so accomplished, so long ago) that narrowly escaped demolition several times. As for Winslow Proper, wow. I think the town must have busted out with pride when the new Church’s chicken opened. De-press-ing. Makes downtown Phoenix bustle. 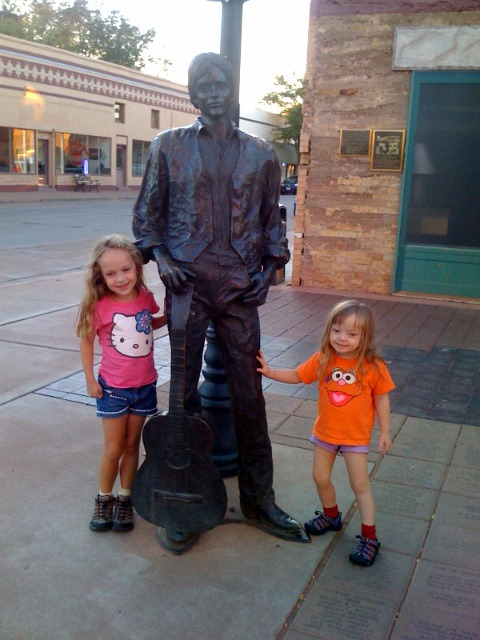 We stood on “The Corner” and explained The Eagles to the girls, then visited one of the two businesses open at 5 pm on a weekday, one of the two gift shops devoted to the song. Inside, a video played an Eagles concert. “You don’t have to watch that thing all the time, do you?” I asked the young woman behind the counter. She nodded, looking sad. 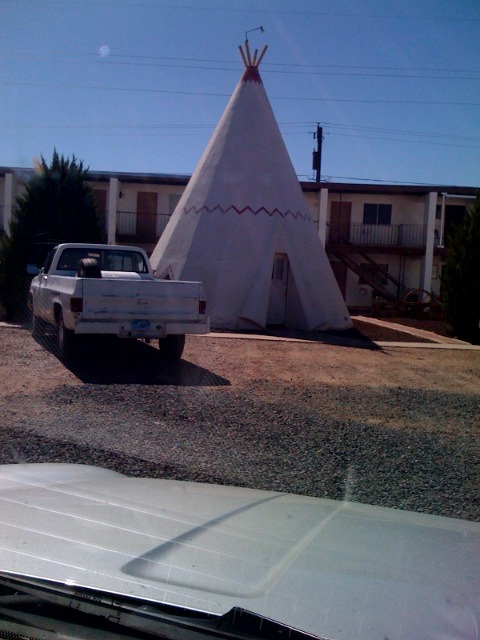 When we drove by the tee pees in Holbrook the next day, Ray and I knew we’d dodged a bullet. Cramped, to say the least (and that’s possibly the best thing you could say about them). We took several pictures and then stopped by the Safeway across the street. 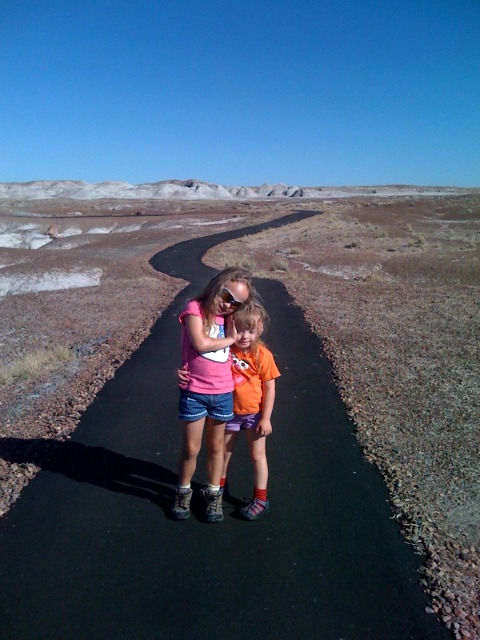 And then we were off to the Petrified Forest/Painted Desert National Park. We’d already been to the Homolovi Ruins (Indian ruins, they’re called, I didn’t see one reference to “Native Americans” the whole time we were in Winslow/Holbrook) the previous day, and would later hit Meteor Crater and Lowell Observatory. Ray and Annabelle also hiked inside a cave, but I drew the line at that; Sophie and I stayed in that day. 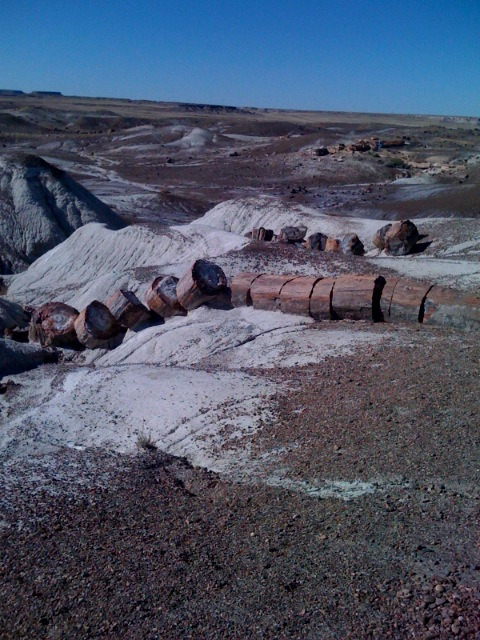 Things got extremely desolate as we headed for the petrified forest. My iphone lost reception, and I was forced to look out the window. I had visions of standing (or at least leaning) trees in the forest and rainbow hues in the painted desert, but Ray had warned all of us. And I already knew — the pleasures of the desert are very subtle. OK, it wasn’t THAT bad, though it was a little warm out that day. Way too bright. We watched a brief movie at the visitors center (I nodded off) and Sophie befriended several AARP members. Turns out it was seniors and us, at most of these places. The upside is that the trails are all paved and managable, which is good since neither Sophie nor I are interested in scrambling. The girls were both troopers, though there was the inevitable whining you’ll find on any family road trip, and without a crib in the room (I swear, I’m planning to deal with THAT at home — soon — really) Sophie was left to sleep with one of us, which made for a couple of interesting nights til we got to Flagstaff and the Pack n Play there. 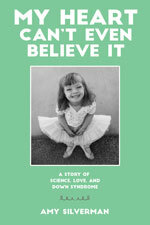 The night she slept with me, Sophie was on the side of the bed against the wall, but there was a small gap. I held onto her for what seemed like hours, then finally let go and fell asleep (Ray swears I was snoring long before that) and then woke up to a loud clunk as she rolled off the bed. I started screaming at Ray to turn on the light and he screamed back to shut up, but amazingly NEITHER kid woke up. Sophie slipped between the wall and bed, made her way to the ground, crawled under the bed and would have continued to slumber if I hadn’t dragged her out. So we were all a little fuzzy. After a makeshift picnic in the back of the Jeep, Ray lured us to a path called the Crystal Forest, which the movie warned was not what it used to be, due to people pilfering the petrified wood (a ton a month, the movie claimed; Ray and I both found that hard to believe) and it’s true it WAS tempting. The girls weren’t that interested in the stuff — it’s weird, some pieces look like wood chips, others like crystals; in places it’s huge, though the Crystal Forest had dwindling piles of tiny hunks — but I found myself dying to take a piece or two. Ray (normally more likely to pilfer) shot me several dirty looks and I finally gave up, sulking as we walked to the car. After a long drive past some petroglyphs (Ray was somewhat disappointed) and — finally — the promised vistas of the Painted Desert (if you’ve been to Sedona, or even Camelback Mountain, skip that detour) we drove to the end of the forest/desert, marked by a ranger station. I had that guilty feeling you get when contemplate doing something wrong and ultimately make the right decision but still feel like everyone knows what you were thinking all along, and visions from the movie of the guy with the pocketful of petrified wood getting handcuffed by the rangers (really, they show that!) kept running through my head as we pulled up and a friendly blonde woman popped her head out of her small station. Suddenly I was really wishing I’d taken a piece of that damned petrified wood. 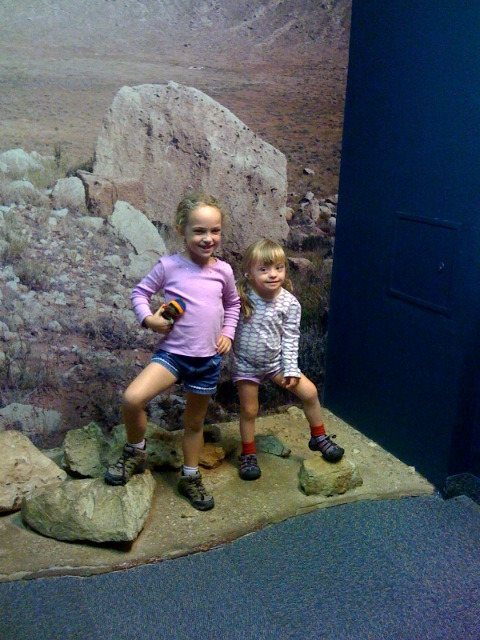 We smiled and nodded and pulled away from the ranger station, and headed to Holbrook to look for rock shops. We have a NY State Park Access Pass, we haven’t gotten around to getting a National Park Service Access Pass yet. I don’t get the reasoning behind it, though, but we do take advantage of it. I used to think it was weird taking “advantage” of my kid’s disability. But what the heck, “regular” parents don’t have to go through the heartbreak of evals and IEPs and therapists, so I’ll take a little perk when I can get it. Yeah, that was a little weird. Meanwhile, I was also disappointed that the trees were lying down. I was, however, 6 years old at the time . . .